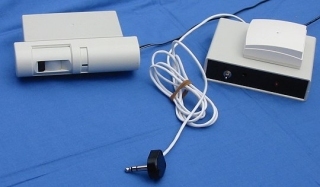 A wireless operated "Over Door Alarm" interfacing with your Nurse Call system. For those residents/patients who, at night, (or during the day) become restless and interfere with others or develop magpie tendencies. No wires to trip over, just three connections-2 to power points (you will need to have your electrician instal a power point over the doorway) and 1 connection to your call system. Immediately they pass through the door, (it can be set to trigger before that) you will be notified on your call screen or pager etc.